Buenos días! Growing up, I thought Old El Paso was the epitome of Mexican cuisine. Just goes to show what I know! Now that I've wised up a little check out these colourful kiddies I made to go with some pulled pork tacos (recipe to be posted later this week) I made yesterday. Clockwise from the top we have Pico De Gallo, Sweetcorn Salsa and Guacamole. Confession time: I used canned sweetcorn for this. What can I say? I love it! Use the sodium reduced, super sweetcorn and you'll be golden. You can of course use fresh steamed or grilled sweetcorn but Gosh! Doesn't that just sound like a lot of work?! 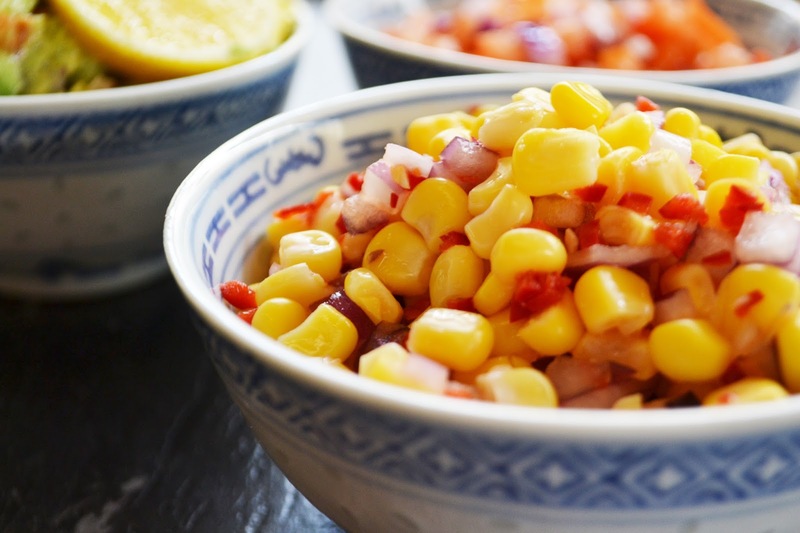 Actually grilled sweetcorn salsa sounds pretty darn good. Next time! I make my Pico De Gallo quite chunky...mostly because I'm lazy and mincing things does not sound like a good time to me. 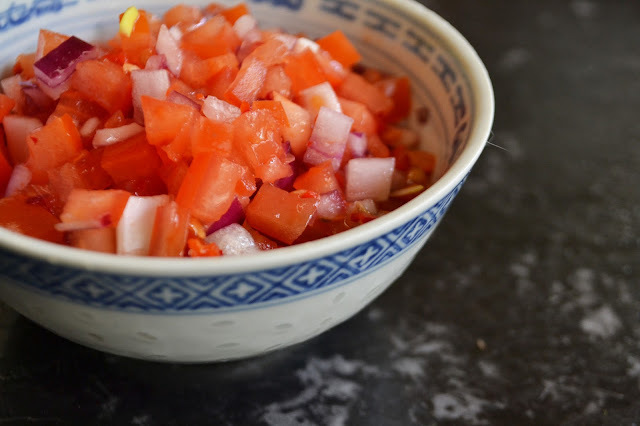 My version of this salsa is so super simple, you'll laugh when you realise just how easy it is! 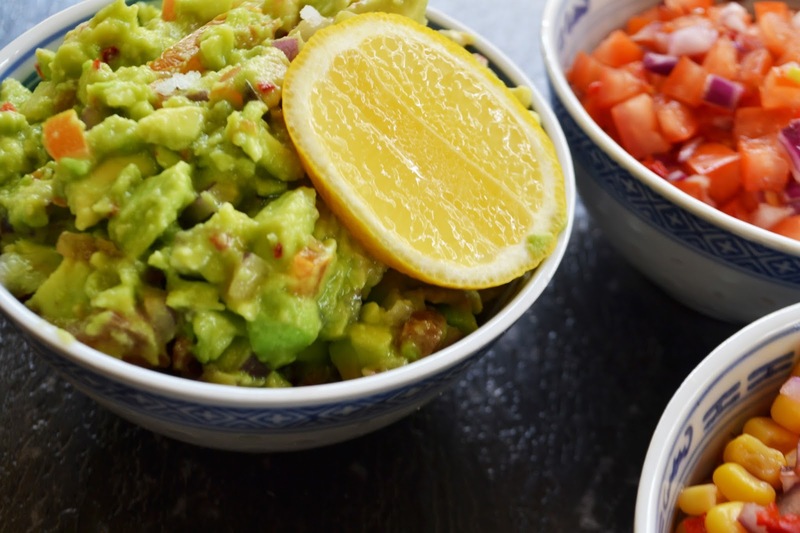 I am having a torrid love affair with guacamole. It's just so fresh, creamy and perfect. Although, truth be told, I don't normally have guacamole when I'm out and about. This is because I have a terrible phobia when it comes to coriander and crossing it's path seems to be inevitable with restaurant guacamoles. I would usually use limes but today I only had lemons and you know what they say...when life gives you lemons! Read on for the recipes. Keep in mind that these are all made to my own personal tastes so definitely feel free to adjust as you wish! I use those gigantic red onions so that's why I've only used a quarter of an onion in the last 2 salsas. 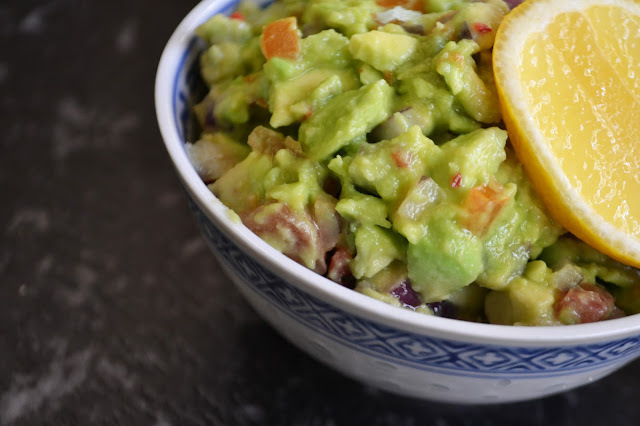 There's really not much to these recipes; it's mostly just the chopping that can be a little tedious but you can also use a food processor, just keep an eye out so as not to puree everything! 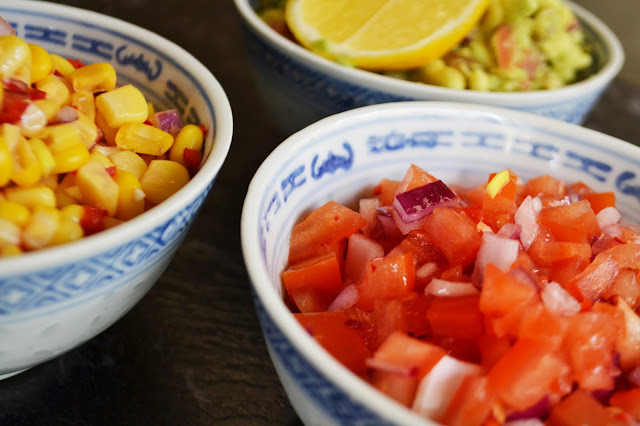 For the pico de gallo, simply combine the ingredients in a bowl and season to taste. 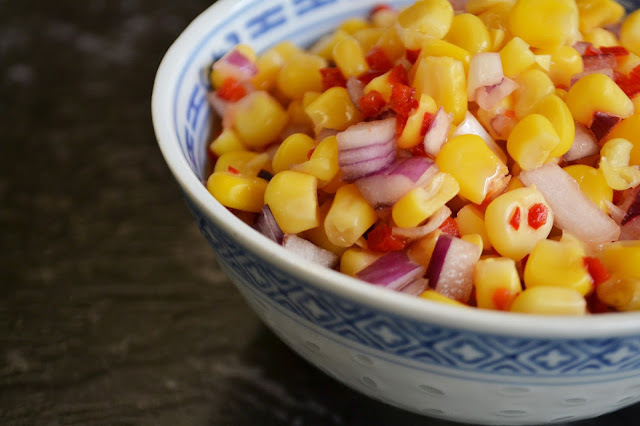 For the sweetcorn salsa, combine the first three ingredients then 'dress' with the lemon juice and garlic. With the guacamole, dissolve the sea salt in the lemon juice before combining with the rest of the ingredients, mashing the avocado slightly as you stir. 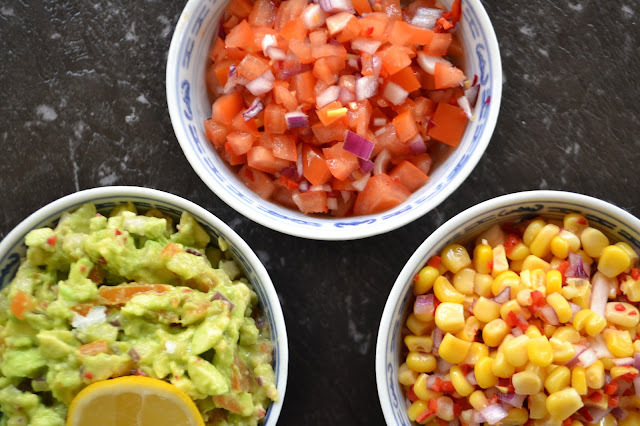 Serve with corn chips, on tacos, in burritos...the list goes on!